The Child Support Enforcement (CSE) program started in 1975 as an amendment to the Social Security Act. Following that, the 1988 Family Support Act, required that by 1997, all states will have a statewide CSE system installed and operational. As of October 2000, seven states, including California, have not complied and, as a result, are paying heavy penalties. Under an agreement with the Federal Office of Child Support Enforcement (OCSE), combined with State Assembly Bill 2779 of 1998, all counties in California are converting to one of four existing systems in the state. Unfortunately, this consortium of systems will not meet the Federal requirements for System Certification. Therefore, California will continue to pay penalties of 100 million per year until a certifiable statewide system is in place and operational. At this point, California is desperate to get a certifiable system installed statewide. However, two questions immediately arises: 1) why spend the time, effort and money to convert to an interim system that will not satisfy the Federal requirements and will not end 100 million per year in penalties, and 2) why spend the time, effort and money for interim conversion, if it will be spent again in a couple of years when a certifiable system is installed? 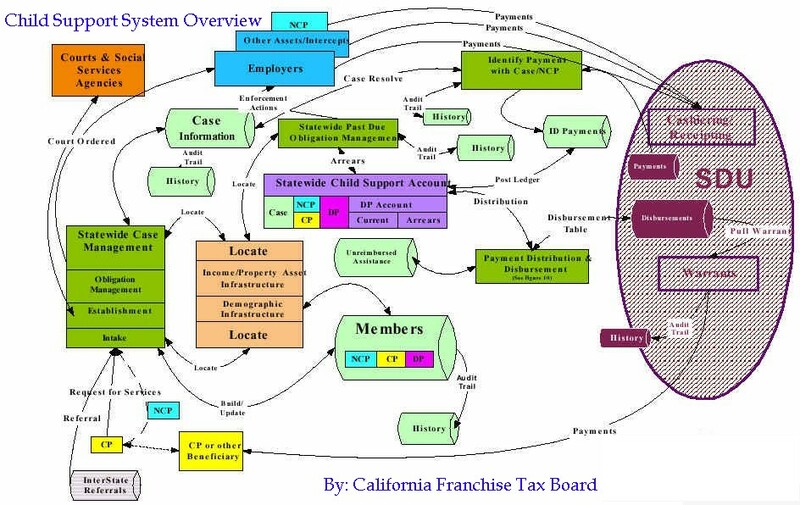 An inexpensive alternative and many CSE business innovations for California are described in this document. This document will describe the components of existing systems and how an existing system could be modified to include the advanced tools, techniques and efficiencies of Information Age technology. It will also describe how this can be done in California for a fraction of the anticipated cost which is estimated to be several hundred million. This alternative would require an estimated 50 million to develop and install and 15 million per year to operate, maintain and support. [These are state costs only for a single, centralized statewide system. A Statewide Disbursements Unit. 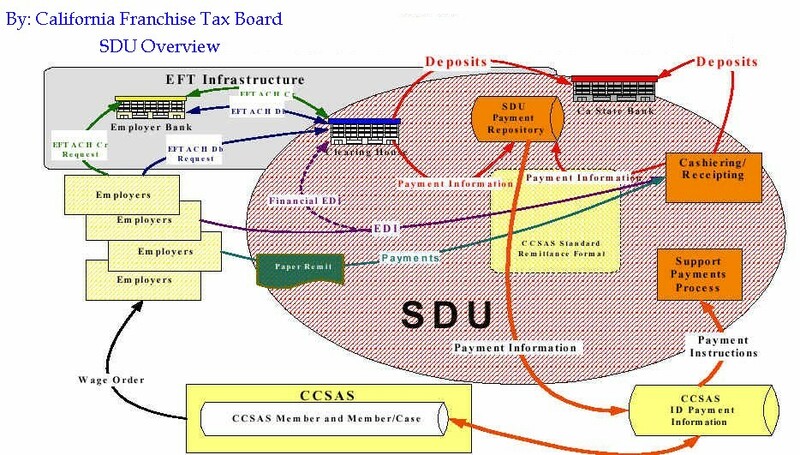 (SDU) is included.] Details to follow. Forty-seven states and territories have OCSE certified systems, installed and operational. This is now a routine system in which caseworkers and administrative staff perform Child Support functions as defined in the subsystems above. However, the system is not as effective as it should be. In California, for example, 87% of the eligible children get no support; that is over 3,000,000 kids. The system for locating Non-custodial parents could be far more effective if 21st Century tools and techniques were included. Even after parents are located, considerable time is expended to pass all the legal requirements and obtain court ordered support. New tools, techniques and incentives are needed at every step to improve program performance and ensure that children are supported. This proposal is specific to the California problem. One clear possibility is to use the existing system in Los Angeles County as the base for a statewide system. It is also possible that the system could be modified, installed and maintained by the State of California. The LA system already has 20% of the state caseload; this software could easily be extended to the statewide caseload. This system seems scaleable to statewide implementation and could be installed without major modifications. However, it would be unfortunate to install a system statewide today, without the powerful tools and techniques of 21st Century systems. The Internet architecture is a key component of the Information Age and will dominate systems design for the foreseeable future. It is, therefore, recommended that the system be enhanced with a "front-end" of Internet tools and techniques. It is further recommended that this new Internet-enabled system be run from one, centralized, statewide, Internet Service Provider (ISP) which could be one of the State Data Centers. Thus, the system becomes a true Internet system and dramatically reduces the cost of hardware and software across the State. The enhancements should include current hardware and software components for interfacing and searching virtually any data base, anywhere. These components should significantly improve the "Locate" function. The Internet-enabled "front-end" is known by many names: Self-Service, Web-enabled, eChild Support, ("e" for electronic), eGovernment, etc. The key concept is that current tools and techniques are added quickly to provide Internet capability and interface with existing applications and data without redeveloping the entire system. What does Internet-enabled mean? It means that the system employs the tools and techniques that make it possible to provide services at any time, from any place. It is possible to link with any other system that is web-enabled to search for data or provide data. It reduces unit costs and service transaction time and therefore, it dramatically improves service. It provides for the implementation of the "Virtual Office" which opens a very wide range of Information Age efficiencies. For example, authorized, certified and authenticated users at the local, state and federal level can work from any place, at any time. These concepts are fundamental to the Information Age. "A Better, Faster, Cheaper, Way"
This system alternative can be deployed statewide, at a fraction of the anticipated time and cost and still include 21st Century tools. 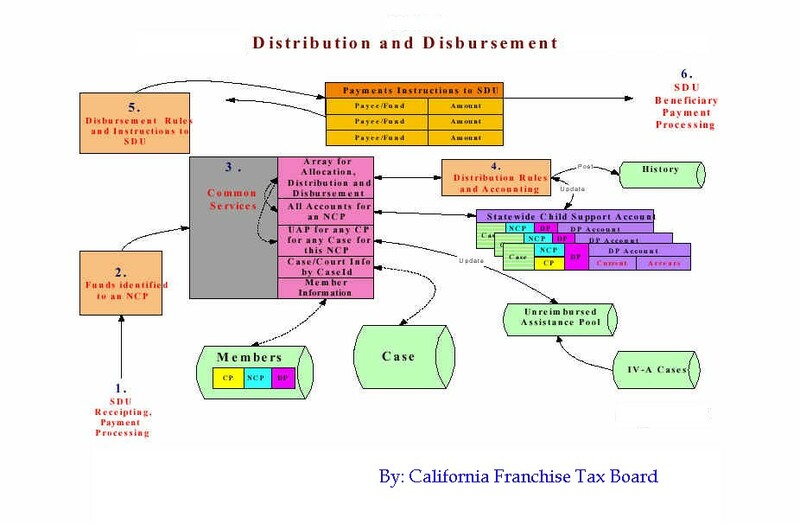 Discontinue, where possible, the current conversion to four interim systems in California. This conversion does not seem productive since it has no impact on the federal penalties, will cost millions and will be performed again in 2003 for conversion to the statewide system. This system already handles 20% of the California caseload which would not require conversion. This system can go statewide with little modification. Include automated Voice Response Units (VRU). Most Information Technology functions are much faster, easier and less expensive today. We have the power, speed and capacity of a "mainframe" sitting on a desk for a thousand dollars. Current development tools allow skilled staff to increase productivity ten fold. Interfacing with disparate data bases is relatively easy now and therefore, the system can find non-custodial parents (NCPs) much more quickly. Data conversion is much easier with the use of common data base interfaces to replicate data from one system into the data base structure of another. Designers and developers can no longer think in old models and must stop spending hundreds of millions on systems like Child Support Enforcement (CSE). The systems of today should cost 25%, or less, then those developed a decade ago. High priced staff notwithstanding, the tools of today are so powerful that final product costs are greatly reduced. The CSE system is well documented, well understood and installed all over the country. So, why should it cost so much and take so long? Using the current and most advanced techniques, the California Internet-enabled CSE system should be operational statewide in less than three years and cost less than the 100 million the state is paying annually in penalties. If possible, the current interim conversion effort should be suspended. The statewide system could be ready before all of the interim conversions are complete. There are only seven major systems in California one of which is LA county; therefore, data conversion will not be a major problem. This could be a state modification and installation project performed by state staff . The estimate provided here is that the cost would be down to about 50 million total, statewide for everything. (See Task List and Budget) Again, we cannot think in old models; everything is cheaper today. However, to maintain this level of performance, the state would have to implement an incentive program for top performing and highly skilled staff to attract them and keep them on the project. This is a "Special Case System"
3,000,000 kids in California will continue to be unsupported. The strategy is to get the best people you can, pay them as much as you can and expect them to routinely perform the impossible. They will. Project teams must be small. One-person projects work best. One highly skilled person, using current tools, techniques, objects, modules, libraries, translators, etc can do the work of ten or more. Organizations must attract extremely high intelligence, energy, training, skill and experience and pay them a lot. The result is that these staff produce products in less time and at less overall cost than any other option. So, the way to get Child Support completed quickly, effectively, and inexpensively, is to attract a team of superstar, mental athletes and pay them accordingly. Implement an incentive pay program for caseworkers and IT project staff. An early and/or late, shift should be established at the local level to facilitate the "Locate" function since networks and systems respond much more quickly during off hours. Use savings and federal incentive payments to establish day care centers at offices. Use one of the state Data Centers as the Statewide Internet Service Provider for the Statewide CSE system with the exception of the Statewide Disbursement Unit (SDU).